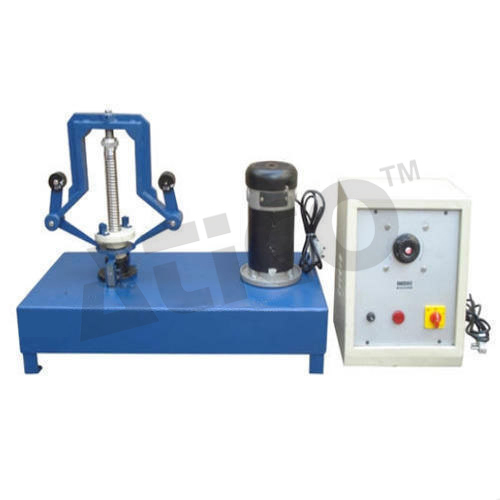 The unit consists of a base upon which the bearing holders and driving motor are bearing can be fitted in a holders to end conditions for test shafts, viz. Both end fixed and one end free, one end fixed. A Variac provided control of driving motor. The unit demonstrates the phenomenon of whirling of shafts with single rotor. As the test is destructive, after the test cannot be used, hence the unit only demonstrates the principle. However, results obtained are closer to theory, as compared to those with bare shafts. Also, It can be demonstrated that, after passing whirling speed, shaft again starts running true. Test shaft - 4.75 mm, 6.35 mm and 7.9 mm - 2 each. Bearing to provided end conditions, (a) Both ends fixed, (b) One end fixed and one end free. Drive motor 1/8 HP, 1500 rpm with control arrangement. The whole unit is mounted on a sturdy base. Rotor for each shaft of suitable size. Floor space area of 2m. X 1m. at working height. 230V, 15 A, AC electric supply connection.